Start by spraying a volumizing hair product onto wet hair. You want a product that will provide lift at the roots. 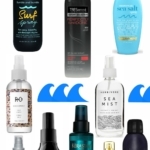 Bumble + bumble Surf Spray is one of the “first” saltwater-based styling sprays and it adds texture and volume to hair. I’ve used Surf Spray for years in the summer –it’s great on long and short hair and is a stylist favorite. Available at Sephora , $23. Dry your hair and then working in 2-inch sections, wrap hair around a large-barrel curling iron and hold for 3-4 seconds. Make sure to start the curl about midway down from the part of your hair. Remember, the look is casual. When you’re done curling hair, add a small amount of a treatment oil into your hands and then work into hair to separate curls and give hair a piece-y look. An excellent one to try is Sedu Anti-Frizz Polishing Treatment with Pure Moroccan Argan Oil (two sizes, 3.4 oz. and 1.0 oz. ), available at ULTA Beauty . What is your favorite summertime hair style? Let me know in the comments! Spring Hair…the latest Styling products!